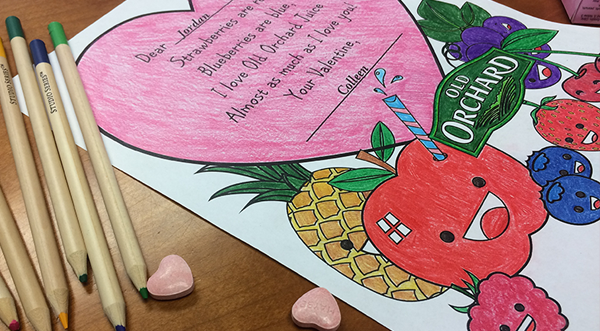 Old Orchard Valentine: Print & Color! Having trouble choosing the perfect Valentine's Card for your sweetheart? We can help! We have created a Free customize-able Valentine just for you. You can enter in your Valentine's name and address it from you. Print off as many as you would like! Click Here for a very sweet Valentine. Love is in the air on Valentine's Day, why not add some Old Orchard Juice?